I once saw an interview with Oprah about what a typical day looks like in her life. She said that she liked to take a few moments in the morning to partake in inspirational reading and offer her mind and spirit up to something greater than herself. That really stuck with me and I try to do the same. I try to find a few minutes each day to meditate or do some reading about everything from creativity, to religion. Sometimes it's an artist's biography or a bit of Eastern Philosophy... whatever it is, I try to find pieces of writing that speak to the heart. Yesterday was Dr. Martin Luther King Jr. Day. I decided to pick up, Letter from a Birmingham Jail. To me, the words struck a cord. Right now we live in a rather tumultuous time. While it might not seem like it on the surface, filled with our First World Problems, under the shiny veneer is a lot of uncertainty. I know that this uncertainty isn't shared by all. I recently had a conversation with someone who said that we were beginning a new era of prosperity and freedom. I have my doubts though. I think nearly everyone who is "different" has those same doubts. When words of hate and injustice are sounded out clearly from the highest office in the country, there is a real fear. As a minority and someone who has only recently gained equal rights, all I can do is hope for the best and work on my level to reaffirm what I believe is right and true. One of the quotes that stuck out to me was, "We must use time creatively, in the knowledge that the time is always ripe to do right." While the intention of these words was to stir social equality and gain human rights, I think that this quote can apply to all aspects of life. Every moment is an opportunity to make something, instead of tearing something down. Every second is a second that could be spent giving ourselves to something greater. I was so moved by these words that I decided to put them down in silver, as a reminder and a touchstone. 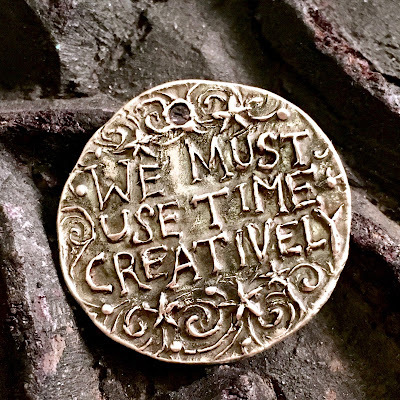 I carved the mold, pressed them out in fine silver metal clay, fired them in the kiln, and then painstakingly hand-buffed and polished each coin. While I did so, I tried to focus on positive energy and direct action. I tried to fill them up with all my best wishes and positive intentions. I tried to push my feelings of doubt and fear down and away and use my time creatively. I made one for myself, but I always try to make a few more just in case. CLICK HERE to take a look at them in the online shop and if you're so inclined, to get one for yourself.